We have made positronium atoms by accelerating positrons from our trap into a porous silica target (which was supplied by Laszlo Liskay in Saclay). We observe the positronium atoms by single shot positronium annihilation lifetime spectroscopy (SSPALS – see here for more information). In this technique we record the gamma photons emitted as the positrons and positronium atoms annihilate. 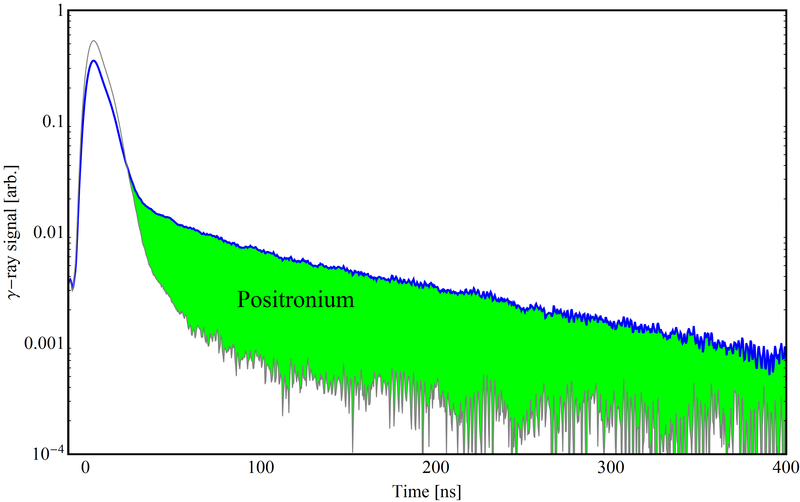 Approximately 50% of the positrons annihilate in the target, producing the large gamma peak observed within the first 20 ns of the trace below. 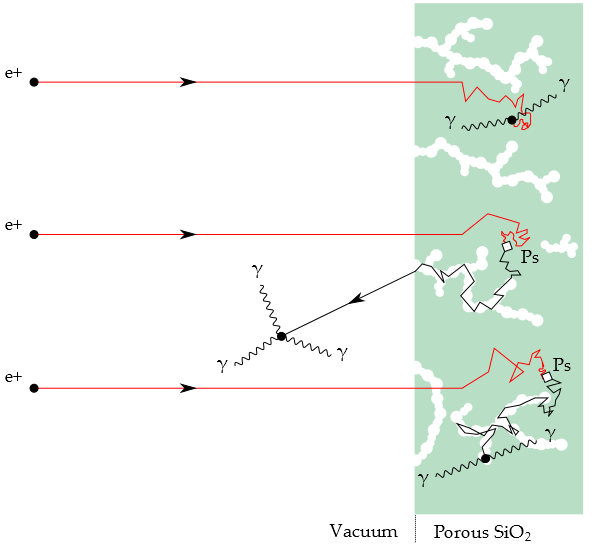 Of the Ps atoms formed, around one quarter are in the very short-lived singlet state (para-positronium). With a lifetime against annihilation of only 120 ps, these atoms also contribute to the large peak. The remaining atoms occupy the triplet state (ortho-positronium) which, with a lifetime against annihilation of 142 ns, lives for over 1000 times longer than p-Ps. This increased lifetime leads to a long tail in the SSPALS trace which is characteristic of positronium generation. The figure below shows two SSPALS data-sets: one taken with a porous silica target and one with a metal target. In both cases the implantation energy was 1 keV. In the case of the metal target (grey data) we observe no Ps formation, and there is only signal from positron annihilation. However, with porous silica target (blue data) we record increased signal at times greater than 40 ns after implantation: the signature of Ps formation. The porous silica target used in this experiment is an efficient source of cold Ps atoms. The incident positrons are accelerated into the bulk material, where they can either anniliate or form Ps. Once Ps has been formed it can diffuse out of the bulk and into the pores. Collisions with the walls of these pores cools the Ps atoms, ultimately to the lowest quantum state of the potential well. The cooled atoms can then diffuse out of the target through the interconnected pores and into the vacuum.